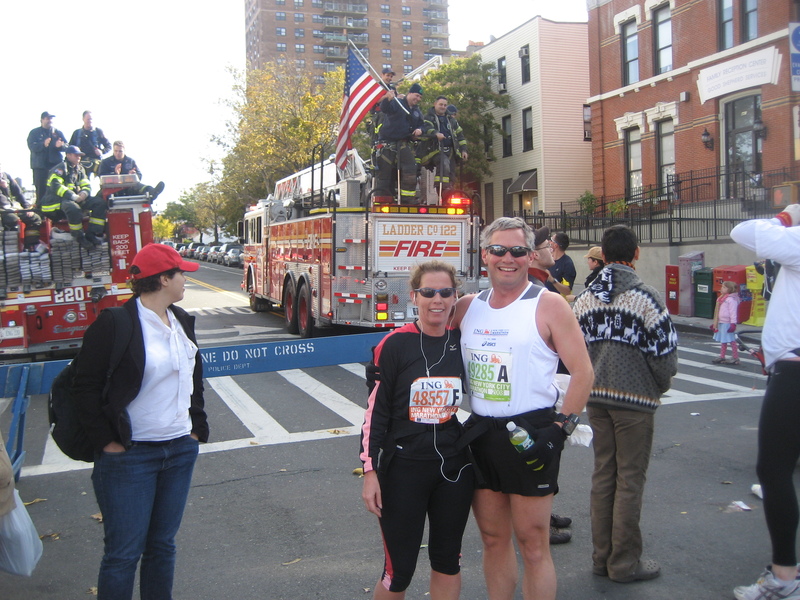 To get into the New York Marathon insures a very diverse race by implementing a raffle type registration. There is a window where you can go and enter the raffle and they choose the names and let you know whether you have been chosen. We had a great time visiting the city and seeing some of the great sites as well as really enjoying the BIG City! What can I say!! It was all that I thought it would be and more!! We were very fortunate as we had a perfect day for running. The Highs were in the 50’s and it was mostly cloudy! I would have to say that this one was very comparable to Chicago as far as the crowds! It was amazing how many people showed up to cheer the runners on! Typically I start doing the run/walk at about mile 3 but the energy from the crowd kept me running most of the way. It was great running through all of the burbs as it really gave us an opportunity to see New York!!! I would definitely recommend this one to anyone who is looking for a great time and easy course and lots of loud crowds!!! This event was well organized!!! This was a great marathon to end on as it was very flat and scenic. You can view a video of our run in the video section (Please note: I have modified video and this is not an exact replication of the path- I manipulated the video to showcase kangaroos, etc on the run). The day prior to the marathon it we had hurricane winds and torrential rains. They were predicting this same weather for race day as well so as you can imagine, we were a bit concerned as to whether we would be able to run and complete our 7 continents! Luckily, the lord was watching over us and and provided us with a beautiful sunny day at about 65 degrees! We went to a shop in Australia to purchase our Australian costumes for the run. We had no clue what we were going to wear this time, but I think we ended up being pretty darn creative. Check out the hats and the alligator on my rear end!!! Woke up early had a quick cup of coffee and headed to the start of the race. As mentioned above, it was an absolutely beautiful day! 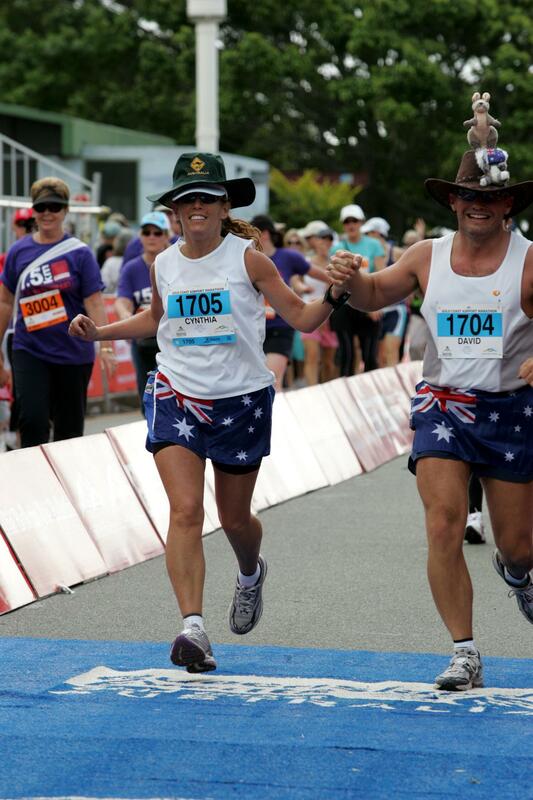 The marathon started at the Gold Coast Airport which was very exciting! There were approximately 5,000 runners in this race (quite a bit smaller then many of our US races!). I remember the speech from Australia’s greatest marathoner, Rob de Castella. He was a great motivational speaker that the reward at the end will outweigh any of the pain and discomfort you feel along the 26.2 mile course! There were a lot of spectators at the beginning of the race and throughout the course. Some great views of Broadwater as well as Main Beach, Surfers Paradise, Mermaid Beach and Burleigh Heights! Meeting up with many of the folks that had also ran the Antarctica Marathon with us! Great to see everyone again! Mile 12 David engulfed a hotdog given to him by a spectator. I think if I would have done this I would have barfed!! Meeting the Aborigines and hearing their stories! COMPLETION OF THE 7 CONTINENTS!!! !